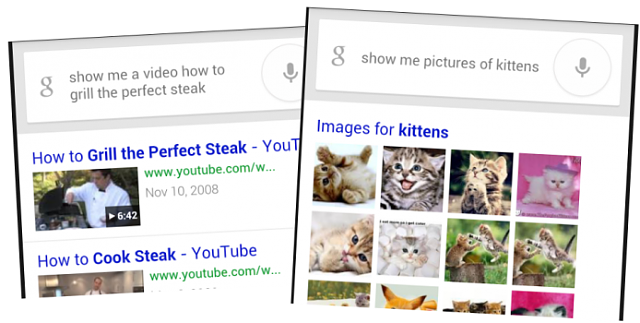 Google Now was introduced in June 2012 as an update to the previous Google Voice Search and Voice Actions that were available in Android. Since then it has been continually updated, with an iOS version and availability in desktop browsers as well. 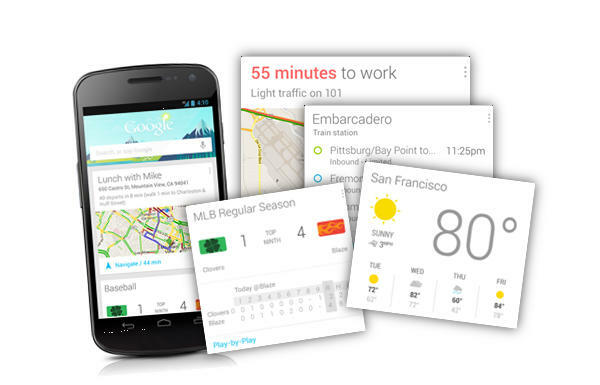 Google Now encompasses several technologies. Chief among these are voice actions and cards. Voice Actions: These are spoken (or typed) commands that will result in Google giving you an answer or performing an action. This can range from asking a simple question ("Who is the President of the United States?") to more complicated actions, such as setting reminders or placing phone calls. I will go into more detail of these below. Cards: These are items that will show up on your screen that provide information relevant to you. They can vary from weather to shipping notices to sports scores. Again, I will go into more detail below. Well, yes and no. 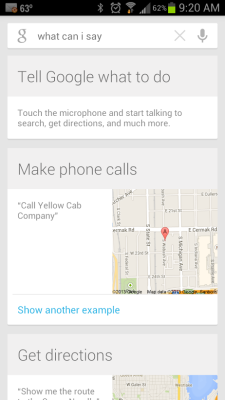 While voice actions existed in Android long before Siri, they were more rigid. Siri really introduced the concept of a more personable "personal assistant" which Google Now is obviously a response to. However, Siri is also very reactive, as in a user will need to initiate it to get a response. 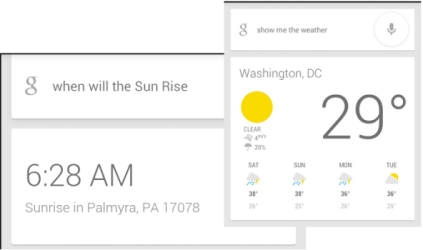 While the Voice Actions in Google Now are similar, a big part of Google Now is providing pro-active information via the cards. For example, a card or notice might pop up with a flight status based on you searching for a flight or receiving a flight confirmation email. Or a card showing tracking information because you received an email with tracking info in it. In other words, it provides information without you having to ask for it. 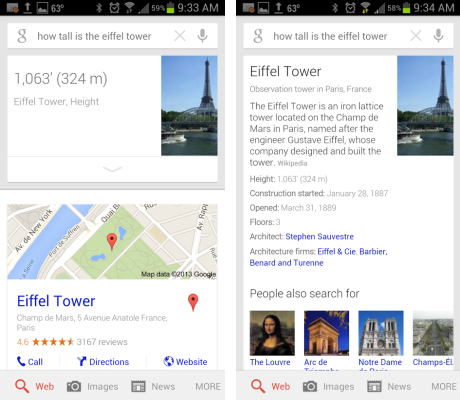 Another thing that separates Google Now from Siri is Google’s response to several types of research questions. As some examples, asking the two “What is the best computer?” will result in Google Now sending you to relevant search results while Siri will give you an answer of “a Mac” (because you know...it’s Apple). Similar to questions such as “What is the best Smartphone” (Google will give you links to research while Siri will just respond with “There’s other smartphones?”). Funny on Siri’s part, but not really helpful if you need to research a topic and can’t trust you’re not going to get back a sponsored or joke answer. 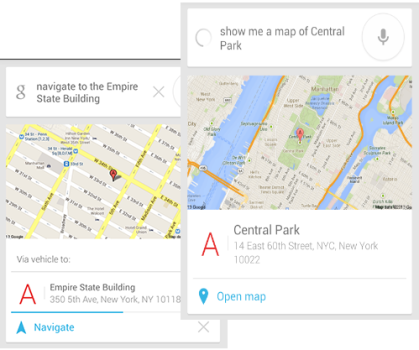 There are several ways to initiate Google Now (and there are even more than the below depending on your phone and how you may have customized your phone). The first thing we’ll discuss is voice actions. To initiate voice actions, you can do several things. There are of course many other options. Knowledge You can ask pretty much anything that you want to research or need an answer to and Google Now will quickly provide an answer. Let’s just take a look at one example to start with. What is 54 x 92? How many Canadian dollars in a euro? How long is Silence of the Lambs? The above are just some examples. The list is pretty much endless. Play around asking it stuff! Other Types of Research Questions: Google Now can also provide results for tons of other types of questions and provide more specific results. Some of these can be based on your location, while still others can be based on time or other information. For example, asking “Will it snow?” will bring up the weather for your location. What is the weather (today/tomorrow/weekend or future date)? Do I need an umbrella (today/tomorrow/weekend or future date)? Will it rain on Monday? What's a good (Italian/Chinese/Indian/American) restaurant near me? How far is MovieTown from me? What’s the stock price for Google? How far is (location) from me? When is the next Pittsburgh Pirates game? How are the Pirates doing? When do the Pirates play next? Did the Pirates win their last game? Has (flight) landed? ex: Has United 450 landed? 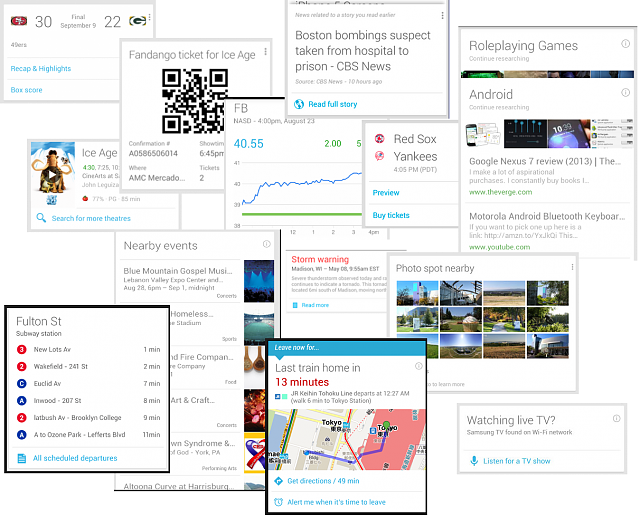 Performing Actions: Google Now also offers the ability to perform a variety of actions. These can range from alarms to reminders to navigation to research. 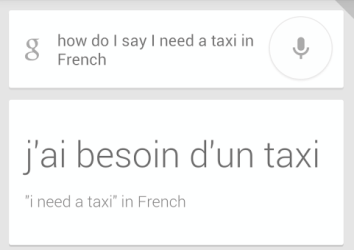 How do I say “I need a taxi” in French? Text Amy Where are you? 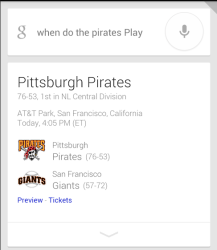 Besides voice actions, the other main feature of Google Now is called cards. Cards are small snippets of information. Some examples of what may initiate cards are a game for your favorite team, stock prices, weather alerts and traffic alerts. Flight notices and boarding passes will show up the day you have a flight scheduled (or the day a flight you’ve searched for is scheduled). Examples are below. Because cards are being added all the time, this may not be an all-inclusive list. Concerts: Shows when you favorite artists have concerts at venues near you. I hope you found this guide useful. I am continually suprised and somewhat amazed (and yes, sometimes even a bit paranoid) on the information Google Now presents to me, but I really feel it's the future of smartphones. Providing information without having to actively seek it out, but rather based on your interests, history and other information has been extremely enlightening and helpful (see my earlier note about it telling me to leave for a meeting early due to traffic between my location and the meeting). It's amazing times we live in. Paul627g, crunchcg, sousabone3 and 11 others like this. Very nice! Lots of good info here. Sorry, just have to say Siri is more well behaved in iOS 7. As in doesn't give cheeky answers. Really? I always thought that was one of its trademark characteristics. Seems like the more i submerge myself in the Google experience the more intuitive Google is. Really feels like it opens my phones capabilities. 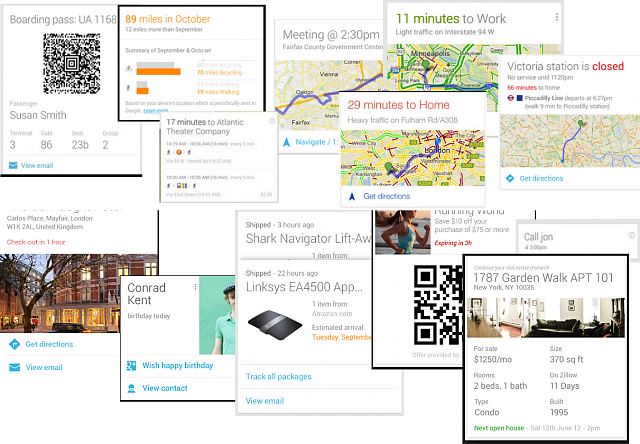 Would anyone happen to know why the Google Now widget only shows me 1 line with 1 card if it feels like it, when it takes up a 4x3 space with a graphic that shows cards can even share lines? Is it an over-time thing? Had my S4 for two months now. It depends on a few things. How many cards are upcoming on Now, and not all cards go to the widget. I have had as many as 6 cards in the widget area, and I had a lot coming up in the next few days. I have also had times where there is only 1 card. I see. Hopefully mine will play nice soon. Between sports teams, stocks, birthdays, doctor visits, work, and several other things happening in a week, I was hoping for more. Even when I have 9 cards in the app, only 1 (if that) appears on the widget. I shall become more patient and harass it with more queries. I had asked the same thing for a while ago. My frustration was that it would show one card on the widget even though there were more in Now. After opening Now, the cards show up on the widget but that's silly. Why would I have to open Now to trigger cards showing up on the widget?? Makes the widget pretty useless. Just a thought, and never cared to experiment with this, but maybe if there is a changing of priorities in the cards might force them to appear? Nevermind...there is no such setting. I just checked. Sorry to get any hopes up. 1. Am I the only one who's having issues when I say "Set an alarm for 7 and a half hours from now"? For example, right now it's 6:30pm, and if I ask it to set an alarm for four and a half hours from now, it sets it for 4am. 2. When I say "remind me to buy milk at 9pm" it says "Saving reminder" then never reminds me. But if I say "create a calendar event buy milk at 9pm" it works just fine. I understand that reminders are connected to cards, and although everything is enabled (cards and reminders are on), nothing works. Seeing similar behavior. 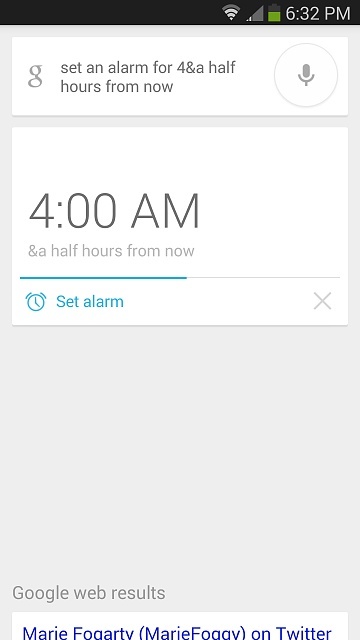 Even the "wake me up in 4 and a half" or using "4-point-5 hours" instead isn't working right. I think they've screwed it up. My GS3 doesn't even activate the microphone about 80% of the time. 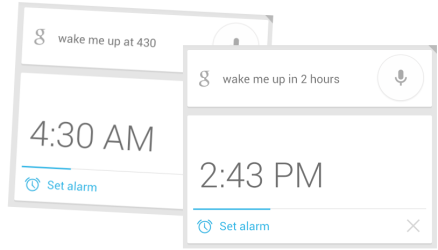 Like "OK Google" wakes it up (sometimes) but pressing the microphone doesn't do anything most of the time. Grrr...been meaning to flash a new ROM anyways to get up to 4.3 or 4.4 so I might do that. New update for Search in the Play Store today. Fingers crossed. Im in london 4 a few days & for the 1st time ever Google NOW has shown 3 cards instead of 1 woohoo lol!